Ever wondered how grapes get to you at the supermarket? They grow on vines, planted in rows, in blocks on farms of varying sizes. And people like me pick them. The first farm I worked on early this year was a lovely small family farm with just 54 rows of seedless white menindee grapes. The big farm I’m working on now has about a dozen blocks, and each of those blocks has over 100 rows. That’s a lot of grapes. And they take a lot more pickers – I believe there were around 300 at the peak of the picking. Pickers generally work in pairs, one person on each side of a row. You pack the bunches into boxes as you go, pushing a trolley that carries empty boxes and a set of scales so you can get the weight right. Each box should have at least 10 kilograms of grapes. 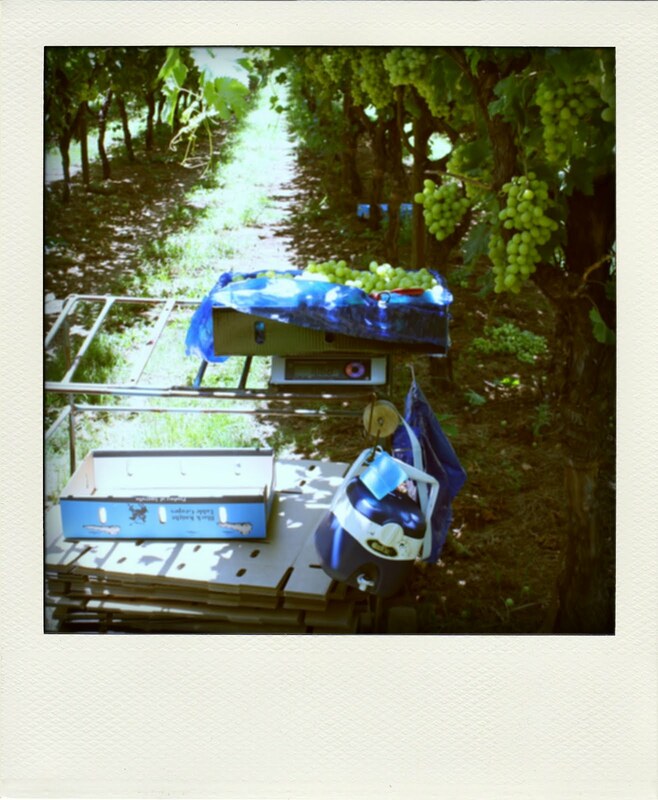 Full boxes are set down under the vines, picked up by tractors staffed by “cart boys” who pack the boxes onto pallets. Then the boxes go back to the shed for quality checks and cold storage before trucks take them to the markets in Melbourne, Brisbane and Sydney. Pickers are paid by the box, at a rate which fluctuates according to market price and the speed with which pickers are putting down boxes. Years ago, when people were picking hundreds of boxes a day, we’d get $1 per box… At the moment, nearing the end of the season with fruit scarce but still in demand from supermarkets, we’re being paid up to $7 per box. As seasonal work goes, grape-picking is pretty sweet – you get a lot of shade from the vines, the fruit is at a good height so you’re not doing anything back-breaking. 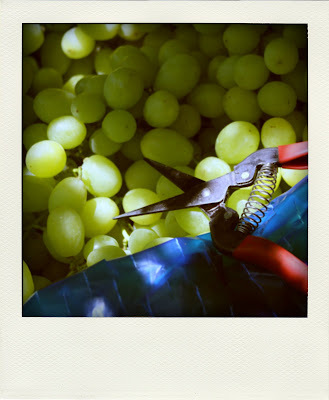 But it can be frustratingly slow when the fruit isn’t good, and you have to snip out rotten and soft berries. 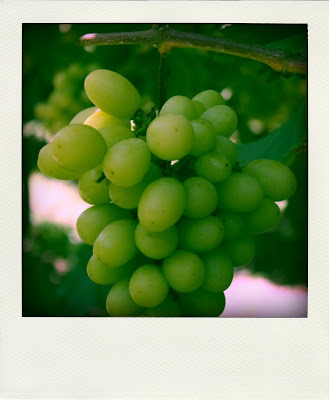 I still remember vividly my first taste of grape picking, the summer I’d just finished high school. I remember a massive induction meeting in the vast, echoing shed. I remember getting lost trying to find the bay we were supposed to pick from, led astray by some nerdy boys who swore they knew where they were going. Just being back at the same farm now makes me feel 17 again; young, and uncertain. And poor. 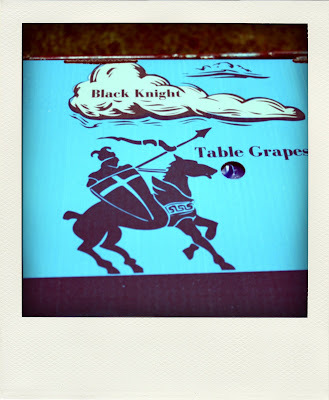 Working at Table Grapes became a yearly summer routine throughout uni, and a reunion of sorts. In those days many of the pickers and all of the cart boys were students, so there was often almost a school dance atmosphere – a lot of weird flirtation in the vines, throwing of grapes, mucking around. The farm provided accomodation for pickers from out of town, dongas that soon came to feel like an extension of boarding school or college. The rest of the pickers were a motley crew. Retirees who’d pick for a couple of months to finance their caravanning between grandchildren for the rest of the year. Professional itinerants who followed the seasons and various fruits around the country. Slightly sketchy people looking for quick cash to get back on their feet. Lots of mullets and terrible tatts and quite a few immigrants. I can remember the Australian Federal Police turning up at the farm once or twice to check visas. Nearly ten years later, and four or five since I last picked, the big farm is a different place. Under new management, it’s now staffed with mostly foreign contractors. My first day there a couple weeks ago, I think my picking partner and I were the only white faces in our group. As well as the dongas, there is now a temporary “tent city” to house more pickers. Many are from India, and there are lots of Koreans who can extend their visa to Australia by doing work like this. Later we found some Dutch and French guys, a mob of Poms and even a couple of Irish who’d blagged their way into jobs in the shed. But it’s a very different mood from the old days. On the farm, time is literally money – and these pickers need money much more urgently than the laissez faire uni students of old, who just needed to fund their textbook purchases and Sunday sessions at the RE. Many other small things have changed in the last decade. Branding has obviously become more important. Once we’d pack only into plain black boxes, which would have lids put on them in the shed. Now boxes must have a plastic liner and often a sulphur dioxide pad on top of the fruit, to preserve it in storage. Then there are different lids to denote different types of fruit – from premium quality (the biggest berries, the cream of the crop) to lesser picks. 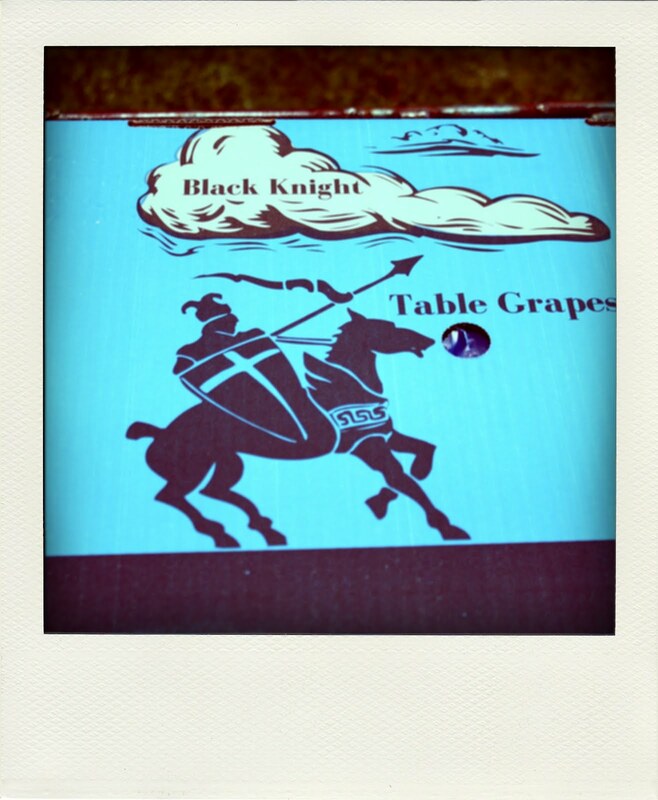 I really liked the design of the small farm’s premium branding, their “Black Knight” grapes… in comparison the magenta lids at the big farm just say “Australian grapes” in comic sans. COMIC SANS!! Dear god. Now we’re in the dregs of the season – the rows we’re picking from have been picked once, twice, even three times before – we’re packing into bunch bags. Bags have been around since I first started picking, but they’ve become very elaborate. I guess it’s a sign of how the big supermarkets can dictate to farmers now. Once we would have just picked ten bags into a box and checked the overall weight. This week, filling an order for Aldi, we’ve had to weigh each bag individually to ensure it’s exactly one kilo; close a zip on the bag; rip off the zipper tab so the customer can’t open it when they make their purchase; and stick a label over each zip. Plus adding a sulphur pad and lid. Making money in this kind of work is all about systems and efficiency of movement. All these extra steps – folding boxes, extra packaging – complicate the picker’s task. Also, this is why you should always wash fruit from the supermarket before you eat it. Most fruit isn’t handled between when it’s picked and when you get it home – all the chemicals sprayed on it are still there, along with traces of anything grotty your picker has been touching. In later years I formed a solid partnership with Matty, a St George local who’s now a teacher up north. Matty loved to listen to cricket on the radio as we worked, and would mimic high-achieving batsmen with a “raising of the snips” when he hit his ton of 100 boxes. Later still my friend Reboot picked with me – we were by then slightly too old to check out the cart boys, but did anyway, as she sang her reworked version of a terrible song about cowboys – “save a horse, ride a cart boy”. And even later I worked with my sister when she finished school, and I wish we had recordings of our ridiculous conversations. More than once I swear we’d composed whole musicals before smoko. Currently I work alongside an old hand with the snips. He’s a high school teacher who’d be nearing 70 and has had an amazing life travelling the world. Bill’s what we call a “gun picker”, one of the fastest of the fast, and he prides himself on finding the quickest way to pick. He times himself on each box, charts his progress through the day, and is furious if he makes any less than $200 per day. Meanwhile I’m lagging behind, lost in music on my ipod, occasionally startled by a tractor bearing down on me or the guttural grunts of kangaroos fighting. Repetitive menial work soon takes on a routine; the hands work away while the mind wanders. I’ve been writing this post in my head for a week, but too exhausted each night to get it written down.